Ventisei Scalini a Trastevere i Roma, Italia: Bestill nå! 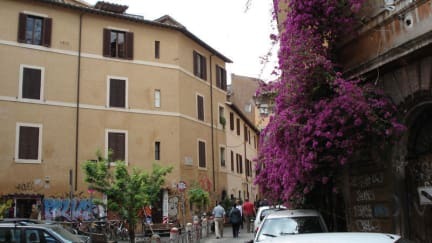 Ideally located within walking distance of the Piazza Navona as well as a range of other attractions the Ventisei Scalini a Trastevere is the ideal accommodation option for your stay in Rome. 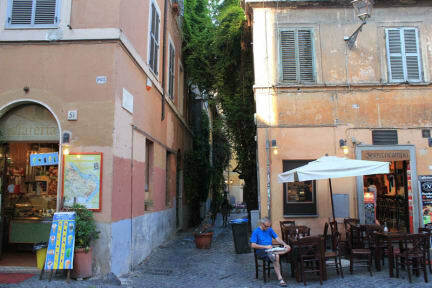 The San Pietro, Castel S. Angelo and the S. Maris in Trastevere are all conveniently located close to the B&B. Ventisei Scalini a Trastevere offers a range of comfortably equipped ensuite guest rooms. Guests can enjoy the freedom to come and go as they please, with the use of their own key and no curfew. Other services included in the price include daily room cleaning, towels and complimentary bathroom toiletries. A tasty Italian breakfast is included in the price and guests can enjoy coffee pods, milk, different teas, chamomile, fresh orange juice, fruit juices, cereals, croissants, biscuits, toast, jam, butter, nutella, yogurt and seasonal fruit. We feature a 72 hour cancellation policy.